The first step in metabolite profiling for fungal identification is to obtain the metabolites produced by the fungi growing on some sort of substrate, see Section 2.2 and Table 1. Depending on the group of metabolites of interest, two main schemes can be used to collect metabolites for a profile: (a) an extraction approach is used for the nonvolatile metabolites, as illustrated in Figure 3, in combination with HPLC and/or MS and (b) a headspace approach is used for the volatile metabolites as illustrated in Figure 4, in combination with GC or GC-MS. Figure 4 Collection of volatile metabolites using adsorption techniques. A stainless steel petri dish lid with a standard 1/4" Swagelock™ fitting in the centre is used to hold the different adsorption tubes or with a septum to be used with a SPME syringe. Sampling is done by placing an adsorption tube, open only in the lid end, in the fitting and leaving the lit on the cultures for a few hours. The tube or syringe is then analyzed. Nearly all sample preparations start with either an extraction based on distribution of the analyte between two immiscible phases or by a gas phase sampling. One phase is the fungus (biomass) and/or growth medium, the other is the solvent or a purge gas. Some physical (thermal or mechanical) assistance may be needed to help the rapid distribution of metabolites between the two phases. There may be some overlap in the compounds determined by the two different approaches, e.g., some of the terpenes can be found in both extracts and by headspace analysis. The key point is to select extraction solvents with a high affinity for metabolites of interest. Adjusting pH can enhance the solubility of metabolites in the extraction solvent. Furthermore, choice of extraction solvent can also be used to favor extraction of a particular subgroup, and a selection of several solvents can be used to extend the range of metabolites. Many extraction protocols use grams of material and many milliliters of solvents, however these procedures can be miniaturized due to the very high sensitivity and selectivity of modern instrumentation. 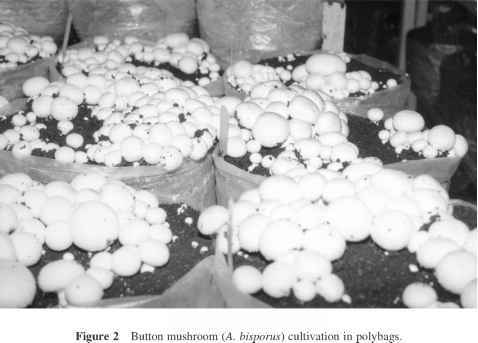 A simple method is the plug extraction method (Smedsgaard 1997a) illustrated in Figure 3, where a few 6 mm plugs (0.5-1 cm2 area) are cut from plates of the fungus and extracted with about 500 ml of solvent. The extraction is performed ultrasonically to improve extraction efficiency and speed. If the raw extract is compatible with the subsequent analysis it can be injected directly, otherwise the solvent have to be evaporated and the sample redissolved in an appropriate solvent (Figure 3). Other analytical applications requires a more elaborate sample preparation particularly if GC-MS analysis is required. If fungi are to be identified in complex natural samples, e.g., foods or building materials a much more elaborate sample preparation protocol is needed. It will nearly always be necessary to remove interfering matrix compounds, by liquid-liquid extraction or by passing the crude extract through a disposable mini-column (solid phase extraction, SPE). Sampling the volatile metabolites from fungi growing in culture can be done by two approaches: either by one of three different dynamic headspace (HS) methods using direct collection of volatiles present in the gas phase above the growing fungus or by extraction of volatiles present in the fungal biomass (or sample). Figure 4 illustrates the simple method to collect volatile metabolites by diffusive sampling described by Larsen and Frisvad (1994; 1995c). 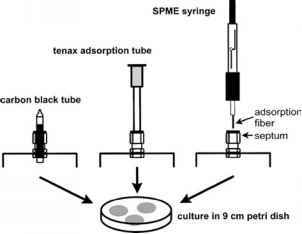 The volatile metabolites are collected by adsorption on an adsorbent, e.g., activated carbon black, a synthetic polymer like Tenax TA, or recently a coated fiber (Solid Phase Microscale Extraction, SPME). Carbon black tubes are normally desorbed using solvents, e.g., dichloromethane or diethylether. Tenax tubes and SPME fibers are analyzed by thermal desorption, the SPME fibers in a split/splitless injection port, the tubes using thermal desorption equipment.